From a producer of Rain Fall and Battle of a Warrior, comes a new epic film about the rise of Mongol Emperor, Genghis Khan, as he builds an empire that spans most of Asia in Kingdom of Conquerors arriving on DVD (plus Digital UltraViolet), Digital HD and Video on Demand March 18 from Lionsgate Home Entertainment. Director Wang Ping (Soul of the Sword) delivers the action-packed film that stars Asian Film Award winner Yu Shaoqun (Shaolin) and Geng Le (Shanghai Calling). 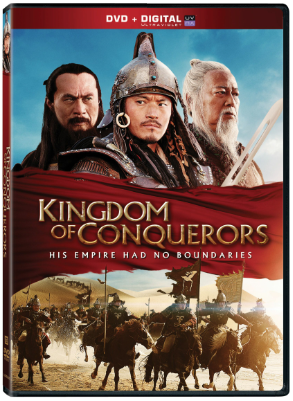 Hailed by critics as “a fascinating historical anecdote” (Variety), the Kingdom of Conquerors DVD will be available for the suggested retail price of $26.98. In the early 13th century, when all the nomadic clans of Mongolia were at war, one man was able to conquer them all and unite them under one banner, his own. Genghis Khan, known for his ruthlessness and barbarism built an empire that covered nearly all of Asia and cemented his place as one of history’s greatest Emperors. Inspired by historical events, witness the rise of the Mongolian Empire. Title Copyright: © 2012 Shandong Film Studio, China Movie Channel of SARFT, Shandong Wohan Culture and Media Co. Ltd, and Beijing Branch of China Film Group Corporation. All Rights Reserved.